The long-term trend is against oil, but we are still in the very early innings of the "end of the oil age." Saudi Arabia has cut oil output and exports leading to dramatic drops in oil inventory. Refining alignments have a significant impact on global oil flows. Some key U.S. shale has tapped the brakes and appears to be moving towards focusing on profitability. Among shale producers, focus on the Permian and companies that can produce out of cash flow. I called the shale boom and the bust over at MarketWatch. I am also on record for calling the "beginning of the end of the oil age." However, that doesn't mean that there isn't what one subscriber called at least "one more puff on the cigar." For about the next decade, before the coming age of EVs, oil will still be in very high demand. During this time, the best oil companies will be very profitable as oil supply and demand find balance. Everything oil related should be looked at in the context of the "end of the oil age." Transportation demand will fall 10-20 years from now - markets will adjust years earlier. Petrochemical and plastics demand for petroleum will begin to fall as well in the next 10-20 years as new technologies are already being used to make plastic bottles for companies like Coca-Cola (KO). Saudi Arabia is the kingdom of oil and will remain so. They are the ONLY nation with the capacity and design to manipulate oil prices. Above all else, know that the kingdom will do what is best for them. That means oil prices will be high enough to maximize their profits without instigating long-cycle oil production as competition. Saudi Arabia made their intents very clear a few weeks ago stating "we'll pump the "last barrel" of oil." Long-cycle drilling from the majors or other countries is most likely not coming to replace declining global proven reserves. Deep-water drilling is indeed doomed. However, a few last megaprojects by companies like Exxon Mobil (XOM) and Chevron (CVX) in South America should be watched closely. The majors trying to save themselves could doom the entire industry to low prices and being unprofitable by the middle 2020s. Russia is essentially a free-rider on Saudi Arabia's mission to keep oil prices around $70-80 per barrel. While Russia will make modest cuts by holding back on investment, they will skate around production limits effortlessly with a wink and a lie. U.S. shale is not nearly as powerful as people think. Production from wells drilled a few years ago are about 30% below estimates made when oil companies needed to secure their last round of financing. U.S. oil production will peak sometime in the 2020s and will never get close to Harold Hamm's 20mbd. 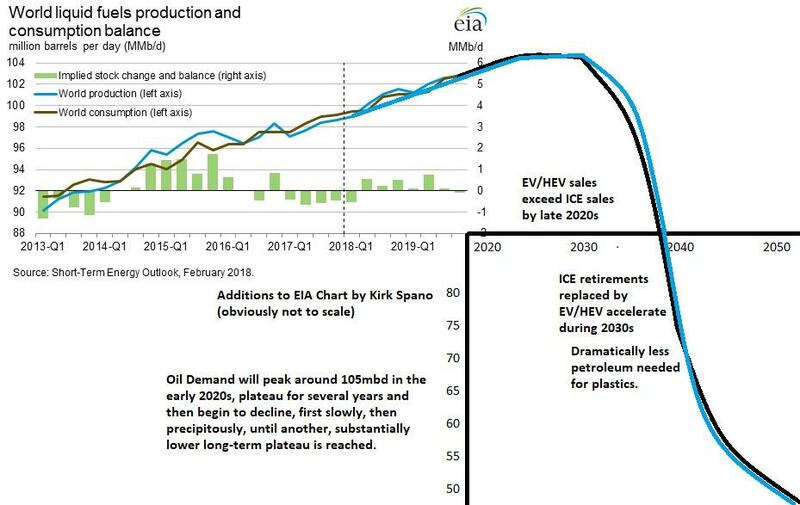 With the exception of the Permian, and potentially STACK/SCOOP, all of the other oil fields in the U.S. are on the edge or already into flattening periods for production and it won't be long before they turn over. It is also important to understand that decline rates continue to be significant, over 30% year 1 to 2 and often over 70% by year 4 of a well. That means a significant portion of capital is used to replace production. Thus, it is vital that companies mind their capex. One main point to understand as capex becomes more constrained by lack of financing and smarter allocation is that will reduce the ramp-up in U.S. oil production. So, as oil production growth outpaced projections in 2018 as many anticipated the unrealized so far Iran sanctions impact while having ample financing, so too is it likely that oil production growth will trail in 2019 - leading to higher than anticipated oil prices of many. Consolidation in the oil space probably leads to more discipline in the space. Exxon Mobil and Chevron are acquirers in the Permian and possibly a few other places where they can bolt-on parts. That should be good for imposing some control on production. Refining configurations mean that heavy sour crude can impact overall pricing of oil - hence the impact Saudi Arabian and Canadian cuts are having. U.S. medium crude and sours are important pieces of the equation. IMO2020 which will dramatically decrease sulfur content of marine fuel. The impact will be that higher sulfur oils will suffer some displacement as there is not enough refining capacity to absorb it. Light sweet could be a beneficiary as ship operators burn straight diesel and gasoline. Financing of oil projects relies on economics, not growth. Already wildcatters are drying up as financing has disappeared in recent months with no new debt offerings. It has become imperative that companies can produce out of cash flow. This is a huge hurdle to growth for many companies. Very few oil companies are truly producing out of cash flow. Fewer still are also returning money to shareholders. Here is a chart showing the 19 oil companies (not all E&Ps) that are both reducing debt and returning cash to shareholders. Most of these topics deserve their own analysis and I will be discussing further - first with subscribers. The short story is that oil is a complex game, but the flow of global oil has no doubt put America on a much different energy trajectory than just a decade ago. Here are my "dirty dozen" oil E&Ps for 2019 and likely for the early 2020s as well. The lowest cost shale basin will also have the best infrastructure by later this year. The Permian is the driving force behind U.S. shale oil. Companies with "good rock" and good balance sheets are where shareholders can find profits for their accounts. You will notice a trend of share buybacks and operating out of cash flow among my picks. Most of these companies are potential buyout targets for the majors. However, there are a limited number of buyers, so only a few are likely to ultimately be bought. I do however expect another merger or two or three. The Permian is the first key to American freedom from OPEC, not some chest-puffing, headline-grabbing, showboating NOPEC legislation. Building a basket of these stocks makes a lot of sense to me. Occidental Petroleum (OXY) is among the top producers in the Permian and in America. They pay a strong dividend and are buying back shares while reducing debt for a very solid shareholder yield. I see Occidental as a better dividend play than Exxon or Chevron as the company has better growth prospects and does not have the legacy issues or potential for stranded assets of the majors. Occidental's carbon capture business is a potential very big deal and underpriced catalyst. See recent Occidental Petroleum presentations. Devon Energy (DVN) is focused on four oil plays now, the Permian, STACK, Eagle Ford and Powder River. Cash from sales or spins of Barnett Shale and Canadian assets will eventually hit balance sheet. Once sales are complete, the company becomes an attractive buyout target. The company is returning an enormous amount of cash to shareholders through buybacks and an increasing dividend. See recent Devon Energy presentations. Pioneer Resources (PXD) has made the move to be a pure Permian producer. The company is seeing massive increases in cash flow. It is using much of that money on a $2 billion share repurchase program and has started growing a dividend. A buyout target based on its Permian focus. See recent Pioneer Resources presentations. Encana (ECA) is diversified across several plays after the merger with Newfield. The merger makes Encana a premier unconventional producer. Synergies and cost improvements will result in improved operations which were already solid. Cash to the bottom line will come after strategic divestitures of non-core assets to companies that can bolt on. Increasing dividend and buybacks. A clear buyout target. My top pick for capital appreciation. See recent Encana presentations. Concho Resources (CXO) is a pure play mega-producer in the Permian after its merger with RSP Permian. This is another company focused on disciplined growth and returning cash to shareholders as it has just begun to buy back shares and pay a dividend. The company has investment grade credit ratings and has been reducing its cost of capital. It reduced debt $175m in the trailing 12 months. A buyout target based on its Permian focus. A similar profile to Pioneer in my view. See recent Concho Resources presentations. Parsley Energy (PE) is a Permian pure play. Its assets appear perfectly positioned for a buyout or strategic merger. The company is just now generating free cash flow and using some for a nascent buyback program. While the company is on a path for perpetual self-funded growth, I see it being merged or bought out potentially this year or next. It is the fastest way to return cash to shareholders and be part of a larger and even more efficient operation. See recent Parsley Energy presentations. Centennial Development (CDEV) is a Permian pure play led by oil legend Mark Papa formerly of EOG Resources (EOG). The stock was recently punished for reporting financial discipline over pedal to the metal growth - traders don't care about the news, so long as they can trade the news. Like Parsley, the company appears to be a perfect "bolt-on" acquisition for a larger company. Primarily an acquisition bet. See recent Centennial Development presentations. EOG Resources (EOG) is a more diversified play than others on this list with operations in the Rocky Mountain region, Mid-Continent and Eagle Ford. EOG has among the lowest cost per barrel and would become very free cash flow positive with higher oil prices that I anticipate. The company is beginning to return money to shareholders as it also focuses on discipline to only spend on double-digit percentage return projects. I can see it selling its Rocky Mountain assets. See recent EOG presentations. There are a handful of U.S. oil stocks in other regions that are also doing well and poised to do well during up cycles, while surviving down cycles. These include companies with different focuses. Here are four I am interested in - I rate all 4 buys now. Hess Corp. (HES) unlike others has sold its Permian assets recently and is diversified across other plays globally. Its Gulf of Mexico operations are attractive for the mix of oils it adds. The company is focused on returning gobs of cash to shareholders and I expect further asset sales. It has bought back over $1.3 billion in shares the trailing 12 months. See recent Hess presentations. ConocoPhillips (COP) is led by one of the most forward-looking management teams. They started selling non-core assets early to refocus the company. The result has been massive returns of capital to shareholders. They have several other key assets to sell. They are focusing on their shale plays (I could have included them in the Permian section as I expect they'll be a buyer there soon), as well as a few other higher margin plays. A steady and safer shareholder return play, but not spectacular, a significant step up from the majors. See recent ConocoPhillips presentations. Continental Resources (CLR) is Harold Hamm's baby and he is buying shares. While he was a great wildcatter, some of his other judgments have been wrong as he is perpetually bullish. That said, Continental is very highly levered to the price of oil and is a bargain at this spot. Its operations are limited to the Bakken and STACK/SCOOP. I think Mr. Hamm could finally be positioning to be bought out. Trade it well, but buy it now. See recent Continental Resources presentations. Chesapeake Energy (CHK) has been a trading vehicle for me for over 15 years, sometimes profitable, sometimes not. It is so beat up that it might have the most upside on a percentage basis. Chesapeake's acquisition of Wildhorse is likely to be highly beneficial as the bolt-on nature of the assets is a strong match. The company continues to make progress reducing debt and still has minor assets to sell. The company is moving rapidly to becoming what Goldman Sachs said could be a "free cash flow machine." Much depends on oil and gas pricing, as it does with all of the others, however, the margins and asset mix at Chesapeake, after a long painful reformation appears to be about to yield results. See recent Chesapeake Energy presentations. Being long certain stocks depending on your risk tolerance makes sense. Occidental is my favorite dividend pick. Encana has great upside for what I consider low relative risk to the group. Devon is a solid midsize company all around. I like selling puts to build positions on oversold conditions as premiums are high on the volatility. Never sell a put unless you are willing to own the shares that can be assigned to you. Sell further out of the money and accept lower premiums if you only want shares at lower cost basis. I believe intermediate term calls on Centennial, Parsley and Chesapeake all make sense. You will need to roll those positions from time to time, as well as, manage for risk. Taking profits on overbought conditions will make sense as well. Do not engage in these swing trades if you do not understand how to trade overbought and oversold conditions or require hand-holding. It's your money, if you are going to trade options, well Don't You Dare Trade Options Until You Read This!!!. Disclosure: I am/we are long CDEV, CHK, CLR, DVN, ECA, PCD, OXY, PE. I wrote this article myself, and it expresses my own opinions. I am not receiving compensation for it (other than from Seeking Alpha). I have no business relationship with any company whose stock is mentioned in this article. Additional disclosure: I own a Registered Investment Advisor, Bluemound Asset Management, LLC, but publish separately from that entity for self-directed investors. Any information, opinions, research or thoughts presented are not specific advice as I do not have full knowledge of your circumstances. All investors ought to take special care to consider risk, as all investments carry the potential for loss. Consulting an investment advisor might be in your best interest before proceeding on any trade or investment.